An “intriguing story” (Publishers Weekly) set in a futuristic dystopia: When Echo, a clone warrior, develops impossible feelings for rebel leader Lia, she must question everything she was built for in the face of newfound love. Buy on Book Bub for .99. 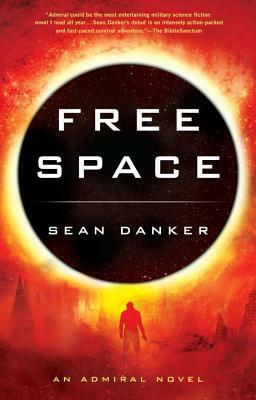 Check out the awesome cover for FREE SPACE, the second installment of the Evagardian series by Sean Danker! To be released spring of 2017. In the follow-up to Admiral, the intergalactic war has ended and hostilities between the Evagardian Empire and the Commonwealth are officially over, but the admiral is far from safe. . . .
I’d impersonated a prince, temporarily stopped a war, escaped a deadly planet, and survived more assassination attempts than I could conveniently count. After all that, there shouldn’t have been anything simpler than a nice weekend with a charming Evagardian girl. However, some corners of the galaxy aren’t as genteel as the Empire, and Evagardians aren’t universally loved, which is how I ended up kidnapped to be traded as a commodity. Their timing couldn t have been worse. I’m not at my best, but these people have no idea whom they’re dealing with: a highly trained, genetically engineered soldier in the Imperial Service who happens to be my date. Bound for their prestigious first duty station, three imperial trainees wake up aboard an enemy ship. The vessel is crippled, and the crew is missing. The only other living person aboard is a man appearing to be their superior, but he’s much too young to hold the rank he claims. He may not even be an Evagardian at all. When sabotage becomes evident, paranoia and suspicions run high, but this mysterious admiral could be the least of their worries. It’s a dead ship on a dead planet; the freighter itself is sitting on ground that could give way at any moment, entombing them all. With no way to call for help, and quickly running out of air and options, their only chance is to embark on a perilous trek across the planet’s surface to reach an enemy colony that may not even be there. With dark questions lingering, they set out – but the planet isn’t as lifeless as it seems, and the war hasn’t ended for everyone. For four hundred years, the Church has led the remnants of humanity as they struggle for survival in the last inhabited city. Echo Hunter 367 is exactly what the Church created her to be: loyal, obedient, lethal. A clone who shouldn’t care about anything but her duty. Who shouldn’t be able to. When rebellious citizens challenge the Church’s authority, it is Echo’s duty to hunt them down before civil war can tumble the city back into the dark. But Echo hides a deadly secret: doubt. And when Echo’s mission leads her to Lia, a rebel leader who has a secret of her own, Echo is forced to face that doubt. For Lia holds the key to the city’s survival, and Echo must choose between the woman she loves and the purpose she was born to fulfill. In celebration of International Women’s Day, two feminist science fiction and fantasy books by female authors that impacted me as a child and still resonate with me today. These writers were trailblazers, writing self-sufficient and strong female protagonists in a genre that was and still is heavily male-dominated. Add them to your to-read list! HOW CAN ONE GIRL SAVE AN ENTIRE WORLD? To the nobles who live in Benden Weyr, Lessa is nothing but a ragged kitchen girl. For most of her life she has survived by serving those who betrayed her father and took over his lands. Now the time has come for Lessa to shed her disguise—and take back her stolen birthright. But everything changes when she meets a queen dragon. The bond they share will be deep and last forever. It will protect them when, for the first time in centuries, Lessa’s world is threatened by Thread, an evil substance that falls like rain and destroys everything it touches. Dragons and their Riders once protected the planet from Thread, but there are very few of them left these days. Now brave Lessa must risk her life, and the life of her beloved dragon, to save her beautiful world. Princess Lissla Lissar is the only child of the king and his queen, who was the most beautiful woman in seven kingdoms. Everyone loved the splendid king and his matchless queen so much that no one had any attention to spare for the princess, who grew up in seclusion, listening to the tales her nursemaid told about her magnificent parents. The king is crazy with grief at her loss, and slow to regain both his wits and his strength. But on Lissar’s seventeenth birthday, two years after the queen’s death, there is a grand ball, and everyone present looks at the princess in astonishment and whispers to their neighbors, How like her mother she is! On the day after the ball, the king announces that he is to marry again—and that his bride is the princess Lissla Lissar, his own daughter. Lissar, physically broken, half mad, and terrified, flees her father’s lust with her one loyal friend, her sighthound, Ash. It is the beginning of winter as they journey into the mountains—and on the night when it begins to snow, they find a tiny, deserted cabin with the makings of a fire ready-laid in the hearth. Thus begins Lissar’s long, profound, and demanding journey away from treachery and pain and horror, to trust and love and healing. I love this cover for my client Stacey Berg’s first book in her dystopian dualogy! It’s a fantastic adventure with bold characters and thoughtful subplots and the cover captures the intensity of the main character, Echo.